Contact Mrs Sylvia Foster, Lead Sonographer. An opportunity has arisen to train as a sonographer. You will join our friendly, hard working and progressive Non-Obstetric Ultrasound team at the Shrewsbury and Telford NHS Trust. 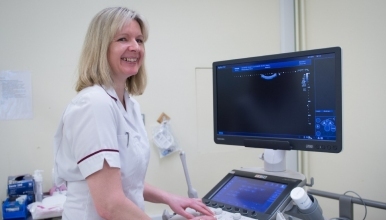 The ultrasound department scans approximately 40,000 patients per year in a variety of clinical settings, working alongside Consultant Radiologists and supporting both Radiology Registrar training and Sonographer training schemes. A recognised degree or Diploma in Radiography is a requirement. The post is for 3 days per week (0.6wte). This will involve attendance at Birmingham City University for 1 day per week to study for a post graduate diploma and 2 days clinical training. The course lasts for 2 years and there will be a period of preceptor-ship following qualification of approximately 6 months. You will study the required modules to enable you to scan abdominal, gynae and small parts. During training the post will be AfC Band 7 - Annex U and will progress to a full Band 7 after qualification, preceptor-ship and on achievement of independent reporting. We are looking for a self-motivated and well organised person with proven ability to work autonomously and as part of a team. You will need to demonstrate a good academic background and a desire to learn. As an experienced and competent Radiographer, you will understand the need for a caring and compassionate approach along with attention to detail. On qualification you will play a key role in the delivery of a quality ultrasound service in both acute and community settings. The post is based at The Princess Royal Hospital, Telford and there will be a requirement to work both here and at The Royal Shrewsbury Hospital. On qualification there may also be the opportunity to work at Ludlow Community Hospital. The department is working towards providing a 7 day sonographer service.